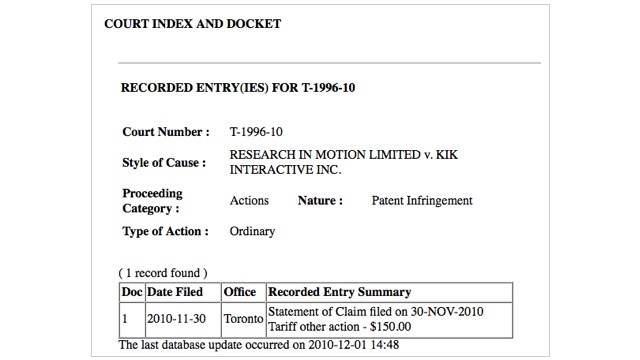 RIM has served papers to the once popular BlackBerry messaging service app Kik for patent infringement. Kik Messenger rapidly climbed to over 2.5 million users in a month but was kicked out of the BlackBerry App World and also had their developer privileges, basically shunning them from existence. The reason RIM stated was for “breaching contractual obligations”… but most likely it has to do with the similarities from their messenger to the RIM’s BlackBerry Messenger. Both services show the user when a message has been sent, delivered, read and responding. Update: The case goes beyond patent infringement. It seems it has to do with BBM and that Kik CEO Ted Livingston actually worked with RIM on 3 different occasions, directly helping to develop BBM. Under the RIM confidentiality agreement Livingston wasn’t supposed to profit from his experience at RIM, hence the lawsuit. In addition, Kik had plans to create a music platform that’s embedded into their messenger – the same thing RIM is doing with BBM.